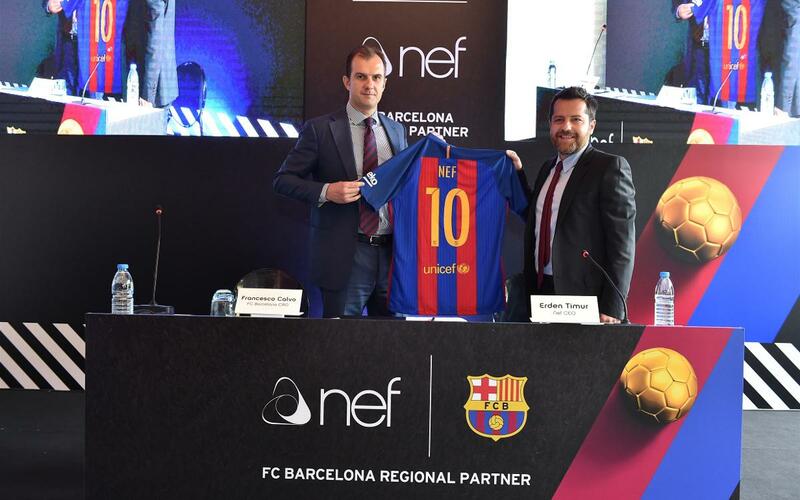 This morning in Istanbul, FC Barcelona and Nef have reached a strategic cooperation agreement whereby the real estate firm has become a Regional Partner of the Club until June 2019, with the possibility of extending the deal for a further year until 2020. The announcement was made at a large press conference, with more than one hundred journalists, attended by FC Barcelona’s Chief Revenue Officer del Club, Francesco Calvo, and the CEO of Nef, Erden Timur. This latest agreement increases FC Barcelona’s presence in Turkey, a key strategic market for the Club’s expansion around the world. . Founded in Turkey in 2010, Nef is the leading real estate developer in its market, both in terms of sales and income. Its personal brand is the construction of unique residential buildings that incorporate a variety of services such as gymnasiums, cinemas and meeting rooms. Through this distinguishing factor, Nef is able to sell 77% of its new residences within the first 90 days of going on the market. This year, the company reached an agreement with the European Bank for Reconstruction and Development whereby 600 million dollars will be invested in the construction of residential and university spaces. Active in the sports world, Nef is currently the main sponsor of Galatasaray.